Make a fashion statement even on a bad hair day! Put on a baseball cap and be at the center of the fashion eye anyway!! Women of all ages surely like the fit and look of baseball caps and the protection they offer from the sun, but most of them are designed for men. Women by birth only want to wear accessories that are flattering, fun to wear and feminine. ShopDrops.Com found just the line to go for! Smart and statement-making. Turn heads on the golf course, tennis court, beach, pool, walking path – even at the mall! Our fashion caps are colorful, patterned caps that are fashionably sporty and terrific for those bad hair days! as per your specification, fashion ladies!!!! Made for women by women in USA. You'll love the comfy fit, soft feel, and fun print. It offers great sun protection whether you are watching a game from the sidelines, playing a round of golf, enjoying a game of tennis, or participating in a walkathon! 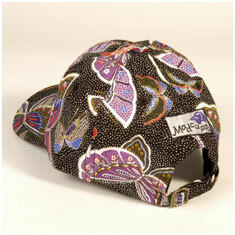 Our new All Aflutter Madcapz is ablaze with butterflies! Beautiful colored butterflies on a black background make this a stunning addition to your women's hat collection. This election season our American Sparklers Madcapz will be your go to cap for wearing on your autumn walks, while you are running around doing errands, or playing a round of fall golf! Animal Safari is one of our most popular Madcapz women's baseball caps. With its' black and brown leopard animal print, this baseball cap is a sure favorite! Aqua Dot has aqua dots on a rich chocolate background. What a fun baseball cap to wear every day! Proudly made in the USA for women by women. Autumn Leaves is the perfect women's baseball cap to wear on cool fall days. The pretty leaf pattern of yellow, brown, orange and gold hues will warm your head on a breezy cold autumn day! Women's baseball caps can't look any better! Celebration is bright pink with a shimmer of silver running through it. A terrific pink baseball cap to wear! Need the perfect fashion accessory to go with the newest colors in your closet? Somewhere in between red and orange, our Color Me Coral Baseball Cap is the perfect topper to your wardrobe! Dot To Dot is the classic white cap with a fun twist! This crisp white cap is covered with tiny colorful dots. No more boring white for you! Turquoise is a restorative calming color - what better way to partner with the HERA Foundation than with a turquoise Cap? For every HERA Cap sold, we will donate $3.00 to the HERA Foundation! Kitty Crowd has bright colorful kitties all over - the purrfect baseball cap for the cat lover! Aren't we all? This is a gorgeous baseball cap for women. This women's baseball hat makes a terrific women's golf hat. Our Not Quite White Madcapz women baseball hat has a fresh clean look without being too stark. This women baseball hat makes a great women's tennis hat or women's golf hat. With Olive & Twist women's baseball cap you can sip in style! Olive & Twist has a blue and green background splashed with martini glasses. A great women's baseball cap for wearing to the beach while you sip that yummy drink! Our Purple Passion Madcapz is perfect for Spring and Summer because purple has a special place in nature: lilacs, lavender, orchids, and violets are all delicate flowers in varying beautiful shades of purple. Snowflakes is the must have winter women's baseball cap! The pale blue background is covered with white snowflakes. This women's baseball hat will keep your head covered in style on those winter days. Our Squiggles Madcapz is a royal blue women's hat with a fun twist. Black squiggly lines cover the pretty blue fabric on this great looking fashion baseball cap! Tigertop is a vibrant animal print women's baseball cap that is sure to make you go wild! The orange and black stripes are so fun.